In addition to a range of high-technology gearboxes and speed variators, the Varvel Group’s offering includes a precision measurement service. The Varvel Group, specialists in the design, production and distribution of power transmission systems, has been supplying international customers with gearboxes and speed variators for use in most areas of industry since 1955. Varvel has always emphasised the importance of research and testing, which does not stop at the design stage but continues even after the finished product has been launched. Thanks to an in-house test department capable of working to key international standards, the Varvel Group is able to perform various types of gearbox performance test. Noise measurement is one form of test that Varvel can carry out in-house to accurately determine the noise (in decibels) emitted by a gearbox during functioning. Against customer requests, and for special purposes, the test department can also perform specific measurements, complete with test reports. Varvel’s noise tests are performed according to UNI EN ISO 3746, which uses an enveloping measurement surface over a reflective plane to determine sound power by measuring sound pressure. This means that Varvel’s noise measurements are performed to standardized, internationally recognized parameters, following a specific, fully documented and agreed procedure. Weighted sound power (dB(A)) is determined on the basis of the average sound pressure measured on a surface surrounding the machine, corrected by a specific background noise factor and a factor for environmental reverberation. Testing is completed using the high precision instrumentation required by the standard, with the test gearbox placed on a stand at the centre of the room, at a height of at least 1 metre from the floor and at a distance of 2 metres from all walls. Five calibrated microphones are positioned on all sides, exactly 1 metre from the gearbox, to measure noise emissions from the gearbox during functioning. The sound pressure measured by each microphone is analysed in bands of one octave to determine sound pressure level dB(A). Drive to the gearbox is then disconnected and the test repeated to measure background noise. 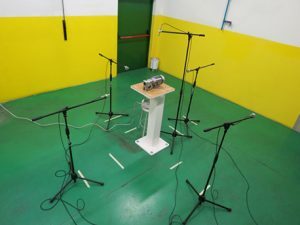 Finally, the microphones are moved to a distance of 0.5 metres from the gearbox and the measurements repeated with the gearbox running in order to determine environmental reverberation. This type of measurement is often requested by customers in order to verify the noise level of gearboxes used in applications that demand quiet, such as hotels, leisure centres, theatres and public venues. Varvel can also measure in-house the vibration generated by a gearbox during functioning. Vibration measurements are an effective means of verifying the correct functioning of a gearbox and the absence of production defects. By measuring and analysing vibration and applying diagnostic techniques, testers can detect gear and bearing defects, something that is particularly useful when a customer asks for technical support. This type of in-house test not only helps to identify and remedy product defects reported in customer claims, but also allows Varvel to continuously improve its entire product range and eliminate the causes of malfunctioning. With a view to minimizing gearbox defectivity, Varvel implements end-of-line quality control procedures based on vibration measurements for all RD Series helical gearboxes, RN Series parallel shaft gearboxes and RO-RV Series bevel helical gearboxes to guarantee the added value of Varvel technology. Vibration analysis is based on the use of single axis accelerometers to measure vibration in a single direction (axial or radial), three axis accelerometers (for combined axial, radial and transverse measurements), optical tachometers and a signal acquisition card. In today’s precision engineering market, Varvel is acting more and more as a full-service partner for everything from product design to production and diagnostics. The competence and instrumentation available within the Varvel Group conform to the highest international standards for research and quality control, and guarantee that all Varvel products offer high technological value. If you are a journalist and you want more information about the Varvel Group, write to marketing@varvel.com and we’ll let you have the answers and the information you need!